The pyramids of Egypt have held their secrets for more than 4,500 years. Now, Egyptian and foreign experts have begun unraveling their mysteries with the help of space particles. The team are using ‘cosmic rays’ to create maps that show the internal structures of these ancient wonders – and they say they could hold some surprises. Last week, archaeologists revealed the first results of their work involving the Bent pyramid, 25 miles south of Cairo. The 3D images show the internal chambers of the 4,600-year-old structure, as well as clearly revealing the shape of its second chamber. Located at the royal necropolis of Dahshur, the Bent pyramid was one of the earliest to be built under the Old Kingdom Pharaoh Sneferu. Mehdi Tayoubi, president of the Heritage Innovation Preservation Institute, said that plates installed inside the pyramid collected data on radiographic particles known as ‘muons’. Muons rain down from the Earth’s atmosphere. The particles pass through empty spaces but can be absorbed or deflected by harder surfaces. It has two entrances, which opens onto two corridors leading to two burial chambers arranged one above the other. Some had suggested pharaoh Sneferu was buried inside the pyramid in an hidden chamber, but the latest scans have ruled out that possibility. WHAT TECHNOLOGY ARE THEY USING TO PEER INSIDE PYRAMIDS? Infrared thermography – Infrared detects infrared energy emitted from object, converts it to temperature, and displays an image of its temperature distribution to reveal objects that may be hidden. 3D scans with lasers – Lasers bounce narrow pulses of light off the interiors of a structure to map it in detail. Once the scanning is complete, the data can be combined into a highly detailed 3-D model. Cosmic-ray detectors – This detects muons that are created when cosmic rays hit the atmosphere. Muons pass harmlessly through people and buildings. Muons traveling through rock or other dense material will slow and eventually stop. The idea is to catch the muons after theyve passed through an pyramid and measure their energies and trajectories. Researchers can then compile a 3D image that reveals hidden chambers. ‘From these plates, more than 10 millions of muon tracks were analysed,’ Tayoubi, who is also co-director of the ScanPyramids mission told Discovery. ‘We count the muons and according to their angular distribution we are able to reconstruct an image,’ Tayoubi said. ‘For the first time ever, the internal structure of a pyramid was revealed with muon particles. ‘The images obtained clearly show the second chamber of the pyramid located roughly 60 feet above the lower one in which emulsions plates were installed,’ he added. ‘For the construction of the pyramids, there is no single theory that is 100 per cent proven or checked’ They are all theories and hypotheses,’ said Hany Helal, the institute’s vice president. ‘What we are trying to do with the new technology, we would like to either confirm or change or upgrade or modify the hypotheses that we have on how the pyramids were constructed,’ he said. The Bent Pyramid in Dahshur, just outside Cairo, is distinguished by the bent slope of its sides. It is believed to have been ancient Egypt’s first attempt to build a smooth-sided pyramid. The Scan Pyramids project, which announced in November thermal anomalies in the 4,500 year-old Khufu Pyramid in Giza, is coupling thermal technology with muons analysis to try to unlock secrets to the construction of several other ancient Egyptian pyramids. ‘Even if we find one square meter void somewhere, it will bring new questions and hypotheses and maybe it will help solve the definitive questions,’ said Tayoubi. The team will also be using infrared 3D scans and lasers to study the two pyramids in Giza and the two in Dashur. The same technology, they say, could also help find a possible hidden tomb in Tutankhamun’s burial chamber that may be belong to Queen Nefertiti. Many previous missions have attempted to unravel the mysteries of the pyramids, but scientists have yet to come up with a concrete theory explaining how the structures were built. Khufu’s pyramid, also known as the Great pyramid of Giza – the tallest of all the pyramids – was built by the son of Snefru, founder of the fourth dynasty (2,575-2,465 BC), and the Khafre’s pyramid or Chephren was built by the son of Khufu. ‘The idea is to find the solution to the mystery of the pyramids,’ said Tayoubi. ‘A similar attempt was made 30 years ago, but this is the first project at a global level using cutting-edge technology to look inside the pyramids,’ he said. Project ‘Scan Pyramids’ is expected to last until the end of this year. Damati said the ‘infra-red and muon’ technologies that would be used to search the four pyramids could also be useful to look for a possible hidden chamber in King Tutankhamun’s tomb, which may be the burial place of Queen Nefertiti. Archaeologists have never discovered the mummy of the legendary beauty, but renowned British archaeologist Nicholas Reeves said in a recent study that her tomb could be in a secret chamber adjoining Tutankhamun’s tomb in the Valley of Kings at Luxor, southern Egypt. Reeves, who was in Luxor in September to probe his theory, believes one door of Tutankhamun’s tomb could conceal the burial place of Nefertiti. Egypt has already approved using radars to search the boy king’s tomb, which was found by British Egyptologist Howard Carter in 1922. Last year, Egypt’s antiquities minister Mamdouh El-Damaty said scratching and markings on the northern and western walls are strikingly similar to those found by Howard Carter on the entrance of King Tut’s tomb. El-Damaty was visiting Luxor with British Egyptologist Nicholas Reeves. Dr Reeves suggested that Tutankhamun, who died at the age of 19, may have been rushed into an outer chamber of what was originally the tomb of Queen Nefertiti. He said high-resolution images of King Tut’s tomb ‘revealed several very interesting features which look not at all natural. Reeves said the plastered walls could conceal two unexplored doorways, one of which perhaps leads to Nefertiti’s tomb. He also argues that the design of the tomb suggests it was built for a queen, rather than a king. After analysing high-resolution scans of the walls of Tutankhamun’s grave complex in the Valley of the Kings, Dr Nicholas Reeves spotted what appeared to be a secret entrance. He uncovered the ‘ghosts’ of two portals that tomb builders blocked up, one of which is believed to be a storage room. 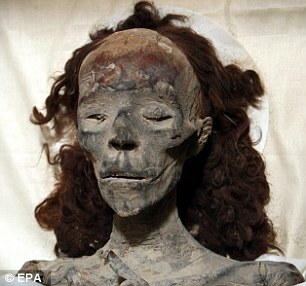 In 2010 DNA testing confirmed a mummy found in the tomb of Amenhotep II was Queen Tiye, the chief wife of Amenhotep III, mother of Pharaoh Akhenanten, and Tutankhamun’s grandmother. Previous Article← 2.8 million year old Human fossil found, will it change history?